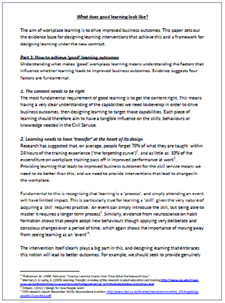 The UK’s Civil Service Learning published a research paper in 2016 on learning and training for the workplace (reference below, pdf on right). “The content needs to be right – The most fundamental requirement of good learning is to get the content right. This means having a very clear understanding of the capabilities we need to develop in order to drive business outcomes, then designing learning to target those capabilities. Each piece of learning should therefore aim to have a tangible influence on the skills, behaviours or knowledge needed in the Civil Service. “Learning needs to use the most appropriate and cost effective method to meet the required outcomes – ‘Good’ workplace learning maximises the value added to the organisation, relative to the cost of providing it, and we should provide learning that uses the most appropriate and cost effective methods to meet the required outcomes. … Whilst we should seek to use digital methods where possible, face-to-face learning clearly has a range of strengths, and is particularly effective where learning is enhanced through high levels of interaction between participants and the instructor. A key consideration here is likely to be whether it involves learning a ‘skill’ or ‘knowledge’, given the need for interaction is likely to be limited for knowledge based learning (unless it is a particularly complex issue), whereas skills based learning is likely to benefit from a high level of interaction with others. This is because knowledge based capabilities are acquired through ’knowing’, whereas ‘skills’ (as mentioned above) are developed through practical application. Giving participants the opportunity to try out particular techniques in a ‘safe’ environment and receive feedback is therefore necessary, which requires face to face methods, whereas knowledge transfer can occur more easily through remote learning. iii. People need more support and direction. Individuals do not have the time or knowledge to make the appropriate choices on their own. They need more support and direction from CSL, managers and colleagues, to identify their learning needs, and establish what learning is right for them. Civil Service Learning (2016), What does good learning look like? at Executive Talent Management Framework, at https://www.gov.uk/government/collections/civil-service-learning, and pdf at https://www.gov.uk/government/uploads/system/uploads/attachment_data/file/499444/what_does_good_learning_look_like.pdf, accessed 12 November 2017. Will Thalheimer (2006), Spacing Learning Events Over Time – What the Research Says, Work-Learning Research Inc., at https://www.phase-6.com/system/galleries/download/lernsoftware/Spacing_Learning_Over_Time__March2009v1_.pdf, accessed 13 November 2017. Page created by: Ian Clark, last modified on 13 November 2017. Image: Civil Service Learning (2016), What does good learning look like? at https://www.gov.uk/government/uploads/system/uploads/attachment_data/file/499444/what_does_good_learning_look_like.pdf, accessed 12 November 2017.